Japan's Mitsubishi Apologizes For Using U.S. POWs As Forced Labor In WWII : The Two-Way A senior executive personally said sorry to James Murphy, 94, who was forced to work in one of the company's copper mines, something Murphy described as "slavery in every way." 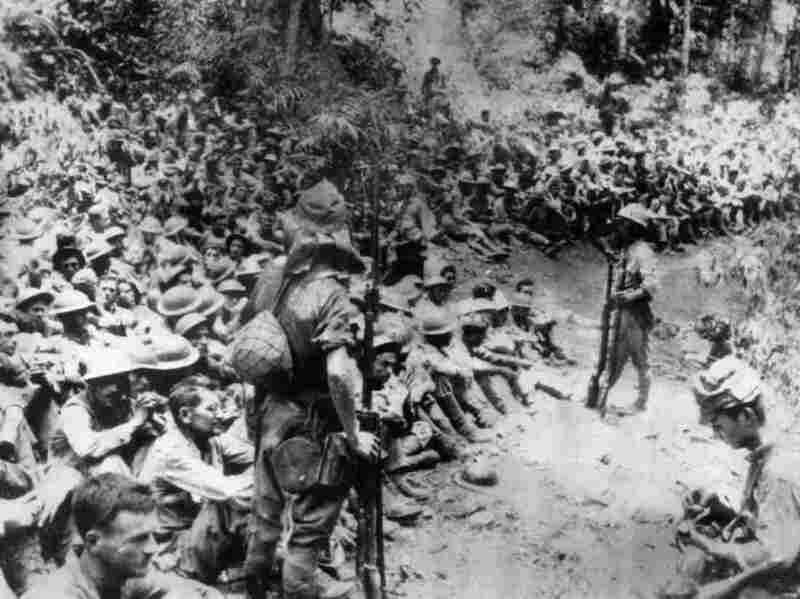 In this 1942 file photo provided by the U.S. Marine Corps, Japanese soldiers stand guard over American prisoners of war just before the start of the Bataan Death March following the Japanese occupation of the Philippines. Some of those who survived the death march were later forced to work for Japanese industry. Japan's Mitsubishi corporation is making a big apology. It's not for any recall or defect in its products, which include automobiles, but for its use of American prisoners of war as forced labor during World War II. James Murphy, 94, traveled from his home in Santa Maria, Calif., to the Simon Wiesenthal Center in Los Angeles, where a ceremony was held and Hikaru Kimura, a senior Mitsubishi executive, made the apology in person. 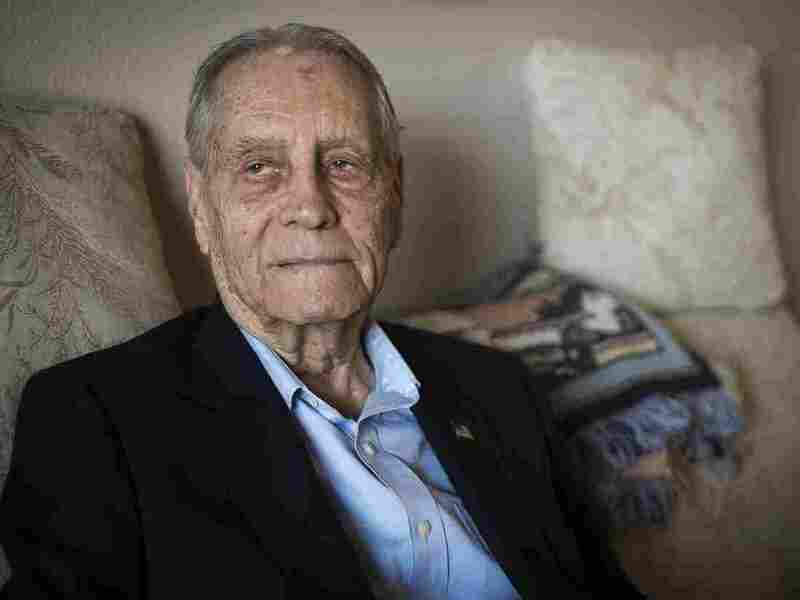 James Murphy, World War II veteran and prisoner of war, was photographed at his home in Santa Maria, Calif., on Thursday. Murphy received an apology from a senior Mitsubishi executive for being forced to work in the company's mines during the war. "Being one of the few surviving workers of that time," Murphy said in a statement, "I find it to be my duty and responsibility to accept Mr. Kimura's apology." Murphy spent a year of forced labor, from 1944 to '45, at a copper mine owned by the company in Japan. He told the Associated Press this week that the experience was a complete horror, "slavery in every way." But in his statement, Murphy took a tone of optimism. "Hopefully," he said, "the acceptance of this sincere apology will bring some closure and relief to the age-old problems confronting the surviving former Prisoners of War and to their family members." NPR's Sam Sanders says Murphy was the only former prisoner of war made to work for the Japanese conglomerate who was able to make the trip. Although the Japanese government has already apologized to prisoners of war for their brutal treatment during the war, this is the first time that a Japanese company has done so. "As far as I know, this is a piece of history," Rabbi Abraham Cooper, an associate dean at the center, was quoted by the AP as saying. "It's the first time a major Japanese company has ever made such a gesture. We hope this will spur other companies to join in and do the same." According to the AP: "Some 12,000 American prisoners were shipped to Japan and forced to work at more than 50 sites to support imperial Japan's war effort, and about 10% died, according to Kinue Tokudome, director of the US-Japan Dialogue on POWs, who has spearheaded the lobbying effort for companies to apologize." The move comes at a time when the Japanese government appears to be trying to put the country's wartime atrocities behind it as part of a larger push to restore its ability to project military power abroad — something that had been prohibited by its postwar constitution. Earlier this week, Prime Minister Shinzo Abe won a crucial vote in Parliament on legislation to give the army and navy limited powers to fight in foreign conflicts for the first time since World War II. The New York Times writes: "The vote was the culmination of months of contentious debate in a society that has long embraced pacifism to atone for wartime aggression. It was a significant victory for Mr. Abe, a conservative politician who has devoted his career to moving Japan beyond guilt over its militarist past and toward his vision of a "normal country" with a larger role in global affairs." Abe has made multiple visits to Tokyo's Yasukuni shrine, which honors Japan's dead from World War II, including war criminals. His government has also sought to downplay or deny the wartime use of so-called "comfort women" in military brothels that impressed mainly Asian girls and women into prostitution. In a Times opinion piece written last year, Mindy Kotler, the director of Asia Policy Point, a non-profit research center, wrote: "Mr. Abe's administration denies that imperial Japan ran a system of human trafficking and coerced prostitution, implying that comfort women were simply camp-following prostitutes."